One good source for breaking news is the English Version of the online news from the Japan Broadcasting Network. 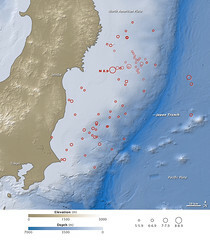 For basic facts of the quake and seismic history of the area, go to this USGS website. And an amazing amount of descriptive info has been posted in Wikipedia. Another useful site is the MCEER Center at SUNY/Buffalo, which maintains a chronological list of major articles and reports. Earlier I mentioned Crisis Commons, a crowdsourcing and mapping info site. Consider the fact that this source and also Wikipedia are done entirely by volunteers. Great work everyone who helped!! Apparently the Honshu location was a surprise to Japanese seismic experts; similarly, the Christchurch, N.Z. location was a surprise to experts in that country. As I recall, the Kiwis thought Wellington had the greatest risk. Clearly, earthquake science is an ongoing learning experience. Financial Aspects — among the anxious watchers of the outcome of the earthquakes and tsunamis emanating from Japan are the major insurance and reinsurance companies. Some are already involved in payout for the N.Z. quake. See this financial account from a German newspaper. I am not sure how they make the calculation, but already they have estimated the cost of damage in Japan at $100B. Additional information about the reinsurance concerns is an an article in Business Week today. On the positive side, see the article titled How Japan Became a Leader in Disaster Preparation in Time magazine online, March. 11. Additional commentary worth considering from Andrew Revkin, blogger for the N.Y. Times. Japan is a best case because it has three vital things: wealth, technological skill and sufficiently frequent seismic activity to boost political will to invest against the worst case. The Pacific Northwest has two out of three, which isn’t evidently good enough.